Draft: 1991, St. Louis Cardinals, 1st rd. October 12, 2011 1B Dmitri Young assigned to Caribes de Anzoategui. November 6, 2009 1B Dmitri Young elected free agency. August 26, 2009 Washington Nationals transferred 1B Dmitri Young from the 15-day disabled list to the 60-day disabled list. July 16, 2009 Harrisburg Senators signed 1B Dmitri Young. July 14, 2009 Harrisburg Senators sent 1B Dmitri Young on a rehab assignment to Potomac Nationals. June 30, 2009 GCL Nationals sent 1B Dmitri Young on a rehab assignment to Harrisburg Senators. June 30, 2009 Dmitri Young assigned to Harrisburg Senators from GCL Nationals. 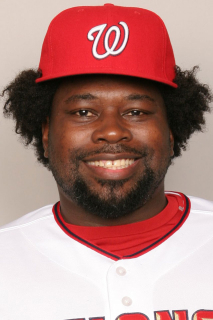 June 26, 2009 Washington Nationals sent 1B Dmitri Young on a rehab assignment to GCL Nationals. April 1, 2009 Washington Nationals placed 1B Dmitri Young on the 15-day disabled list.